With a darling v-neckline, the garden party outfit will be oh so sweet on your little lady! The knee-length skirt and dresses are perfect for a carefree playdate or dressed-up affair! 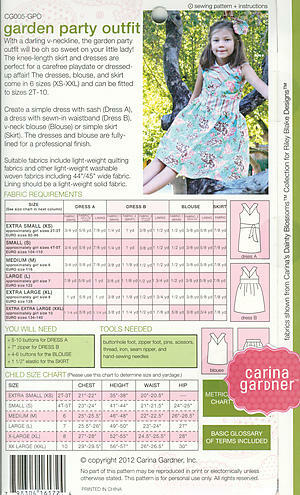 The dresses, blouse, and skirt come in 6 sizes (XS-XXL) and can be fitted to sizes 2T-10. Create a simple dress with sash (Dress A), a dress with sewn-in waistband (Dress B), v-neck blouse (Blouse) or simple skirt (Skirt). 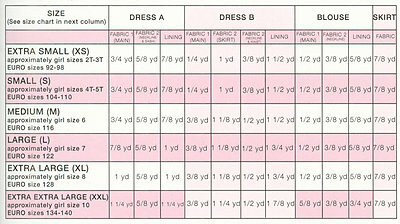 The dresses and blouse are fully-lined for a professional finish.